The Santa Maria Azores Map is a nice little tool that you can use to get an idea of the size of the island. It is a fairly small, measuring just 17 by 9.5 kilometers. Like many of the islands in the Azores, it is possible to drive around the island in just one day. But you will have a far better time if you stay for several days and explore the island at a more leisurely pace. This allows you to fully appreciate the island. 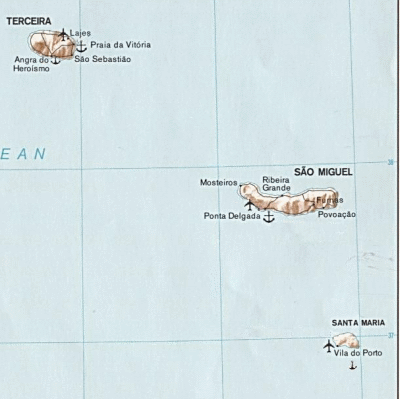 This Santa Maria Azores Map is easy to use so you can explore the island. Simply use the tools on the upper left corner of the map to zoom in or out and to move up, down, left or right. Anjos - Christopher Columbus stopped here - why don't you? Read more about Santa Maria Acores or go to the Magical Azores Islands home page for lots of information about all of the Azores Islands.